As the nature of the business, decisions are taken in either certain or uncertain situations. Therefore, we need to deal with risk management in uncertain decision making. In this essay, we will try to explain what kind of operations research techniques are used in better decision making. To start, we need to define what operations research is. Operations research is an interdisciplinary branch of mathematics which uses methods like mathematical modeling, statistics, and algorithms to arrive at optimal or good decisions in complex problems which are concerned with optimizing the maxima (profit, faster assembly line, greater crop yield, higher bandwidth, etc) or minima (cost loss, lowering of risk, etc) of some objective function. As it is seen from the definition, the related technique is mainly used for optimizing the decision making. This will decrease the uncertainty and of course mitigate the risk. Nevertheless, although this technique is useful for reducing the risk, since the computations are mainly dependant on the previous data or personal experiences, this doesn’t mean that the risk is totally avoided. After these statements, we will concentrate on the basic tools used under this principle. One of the most important tools used for this purpose is decision tree. 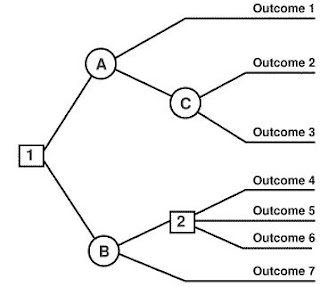 The decision tree classifier is one of the possible approaches to multi-stage decision making. The basic idea involved in any multi-stage approach is to break up a complex decision into a union of several simpler decisions, hoping the final solution obtained this way would resemble the intended desired solution. In order to use this tool, the originator should be very careful about the sequence of the events and the demonstration of the nodes become vital. At the end of each line, the results should be considered. If the result of the decision is uncertain, a circle has to be drawn. If the result is another decision that the originator needs to make, a square must be drawn. Squares represent decisions, and circles represent uncertain outcomes. The originator should write the decision or factor whether it is a square or circle. This is illustrated in the following decision tree. As it has been defined in the last paragraph and illustrated in the above figure, the nodes; A-B-C stands for uncertain events and 1-2 stands for certain conditions. Therefore, the decision maker needs to take decisions in the numerical nodes but he/she must be aware of uncertain situations in the alphabetical nodes. For business, this technique is mainly dealing with the calculation of expected utility or expected monetary value of the project. The formulas are depicted as follows. After stating the formulas, let’s continue with the given example in the following. An investment bank is utilizing its funds in overnight investments (A), bank loans (B), corporate loans (C) and real estate investments (D). These funds are all put by the stake holders and the stake holders have the opportunity to invest in O/N investments while they are sure about a risk free gain of 5% p.a. However, what ever invested rather than this investment has risk. If the risk becomes real, the outcome will be 0 for the investor. This will be named as non-performing. Concerned structure will yield us the following decision tree. Since E (V)invest in bank = 6.125% > E (V)invest in O/N = 5% for the stake holders, they will prefer to invest in an investment bank. This doesn’t mean that investing in a bank will be better than investing in O/N in all circumstances. However, since the probability of the default in “invest in bank” alternative is highlighted, the stake holders will be more certain in making a bank investment. Same computation also goes for expected utility. But, for expected utility, the originator put his subjective opinions that may cause a big fuss in the calculation and decision making. This calculation may be useful for calculating operational risk. An example is shown in the following. ABCD bank is trying to find what will be the possible burden on the bank’s operation due to operational risk. The bank has calculated the possible utility loss per each type as depicted in the following decision tree. The outcomes were given minus U’s (Utility) since they are subjective measures. 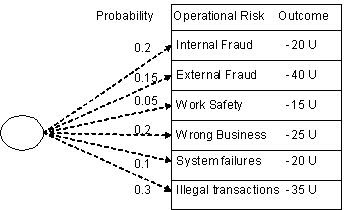 According to the following table, the bank is under high risk and the bank should cover it by implementing different operational risk management models. 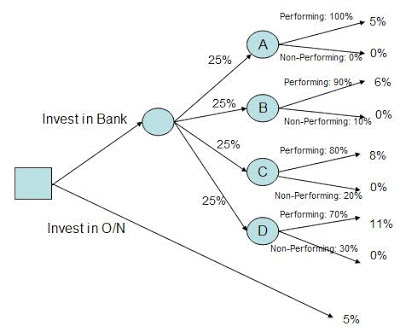 To sum up, when we come to risk management, it is for sure that these decision trees will mitigate the risk incurred. This is because it is helping to decrease the uncertainty. The managers are more aware of what will happen in the future by considering the previous information on the probability of the different and possible outcomes. After analyzing operations research, we will concentrate on Statistical tools. Before going into statistical tools, we will define statistics. Statistics is the branch of scientific inquiry that provides methods for organizing and summarizing data and for using data information in the data to draw various conclusions. One of the main concepts of statistics is normal distribution. 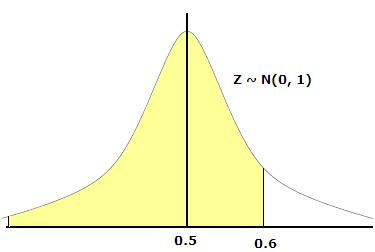 Many numerical populations have distributions that can be fit very closely by an appropriate normal curve. This makes normal distribution very much popular beyond the other distributions. 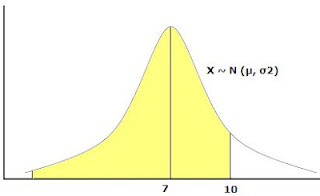 The Normal distribution describes a special class of such distributions that are symmetric and can be described by the distribution mean µ and the standard deviation σ. If X is normally distributed with mean µ and the standard deviation σ, we write X~N (µ, σ2). In order to calculate Z the following formula will be used. Let’s see this formula and the meaning of Z in the following example. An individual wants to insure his house against fire and robbery. He applies to an insurance company and asks for 10 years insurance scheme. The insurance company knows that (depending on the previous data) the claims are coming with an average of 7 years with a standard deviation of 5 years. The insurance company wants to know the probability of realization of risk in this case. When we apply the above formula, we want to calculate P(X<10). First of all Z should be found. This is calculated as follows. The correspondent normal distribution for the value X is depicted as follows. And, the other normal distribution regarding Z values which are the corresponding values of X values that were depicted above is shown below. P (Z < 0.6) = 0.7257 which is depicted in the below table. This means that the insurance company forecasts a claim probability of 72.5% in the coming 10 years. By factoring this claim probability, the insurance company will do a good pricing which covers the probable claims. Other than normal distribution, there are other distributions such as gamma, exponential, logarithmic etc. Nevertheless, due to the lack of place in this study we have only given the example from normal distribution which has helped us to understand how normal distribution will be used in the risk management concept. S. Rasoul Safavian and David Landgrebe, “A Survey of Decision Tree Classifier Methodology”, IEEE Trans. Systems, Man,& Cybernetics, V: 21, No. 3, 1991, p.661. Hamdy A.Taha, Operations Research, USA, Prentice Hall, 1997, p. 532, 545.